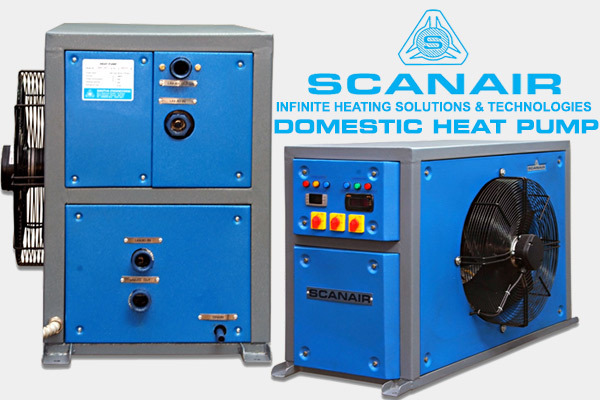 Scanair domestic heat pump water heaters are manufacturers and suppliers of innovative and cost effective solutions water heating and cooling for hot & chill showers applications. These superior quality SS 304, SS 316L grade mirror finish tank fabricated from 50 TO 500 Ltrs holding capacity and dipped coil copper fined grooved pipe heat ex-changers. On above condensing unit are made from high quality GI powder coated fabrication raw materials which ensure high durability at its user ends. 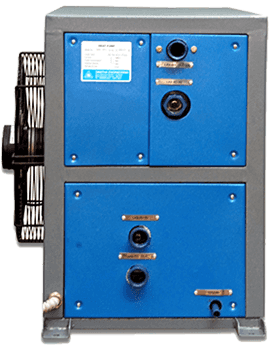 Our Temperature range starts at 5˚C to + 65˚C ± 1˚ C, capacity from 0.5Kw to 5Kw the shower booster pumps From10 LPM to 50 LPM with different heating and cooling capacity. Scanair heat pump does not use any electric element to heat the water. The electricity it uses to drive the fan at the evaporator and compressor. That’s it. For this it uses less electricity than an electric element inside a geyser. As a matter of fact, it uses 1KW of energy to produce 4KW of heat energy. A conventional 3KW electric element used to produce 3KW of heat energy. So a heat pump geyser will save you 60-70% (some application even more than this) on the water heating consumption. These heat pump water heaters absorb the heat in the air and transfer it to the water in the storage thus increasing the temperature of the water and releasing cool air outside. That is why one experiences coolness around these types of water heaters. In fact it can actually be used for cooling the air any fresh cooling application like hot zone areas . Water heaters heat pumps not only heat the water but they do so very efficiently and very quickly. This is because in addition to the electricity they consume, they also take the heat from the air to heat the water. Heat Pump water heaters are the best option one who wants save electricity. This is because its efficiency is increased as in addition to consuming electricity, it also takes up heat from the surroundings to heat the water up. So it means that the same amount of water will be heated up in lesser time than in a regular water heater, If a regular water heater consumes 1 kw to heat up a given quantity of water a heat pump water heater, in addition to the 1 kw takes up heat from the surroundings amount to 3 kw on the same 1 kw electricity consumed on an average. This means that on the same 1 kw electricity being consumed, a heat pump water heater provides 4 kw output (1 kw +3 Kw) It entirely depends on the heater that you are buying so it is advised that you go through the product in detail and specification of them. Heat pump geysers are growing in popularity As compared to solar geysers, which are dependent on good sunshine, heat pumps don’t even need any sunshine, it will the work perfectly well in the middle of the cool night or in the middle of a rain storm. Installing a heat pump geyser is not more expensive than solar geyser. Suppliers claim that you will have regained your capital investment in less than 2 years (some even say 18 months) purely on savings on your monthly electric bill. Finally, heat pumps do make a contribution towards saving the planet less electricity also means CO2 and other emissions. Some people complain that a heat pump does not make the water hot enough (which is above 60 degrees C). They don’t realize that it does not make any sense to set the temperature in any geyser any higher than that in any case. And also Scanair heat pumps can provide pre-heating of domestic, industrial hot water before using a secondary source to raise the temperature to the desired level.